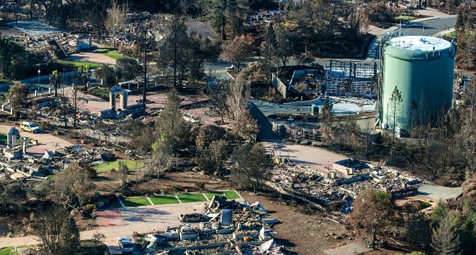 The Northern California city suffered one of the deadliest fires in California state history. In the aftermath, it now confronts a costly pollution problem likely caused when melted plastic pipes released chemicals into the water supply. The M-Fire Company is reacting with climate change solutions to solve every part of wildfire defense better than what is currently being used with a proactive solution. As our brave firefighters are watering down homes lost to wild fire they are trying to keep those homes from re-ignition. M-Fire has developed a slurry that can be sprayed on hillsides before wild fires to defend the advance of wild fires. The slurry can be used to spray over homes or high density buildings that are attacked by arson to knock down the fire and smoke in seconds, while we encapsulate the toxins that are destroying our ground water. Everything M-Fire does is supported by 3rd party accredited fire laboratory test results along with live burn demonstrations at fire training centers witnessed by Fire Officials and Firefighters alike, because we respect those that one day may have to go in one of the buildings we have defended. All Fire Defense Chemistry Should have Auditing and Chain Of Custody Documentation. Its time to raise the bar on all fire defense, especially when it has chemicals involved. All fire defense chemicals should be made to do UL GreenGuard Gold testing before they can be used and spread from planes around humans. All fire chemistry should take there laboratory test results into every community they plan to use those products in and before they use them. They should be made to test them at Fire Training Centers in front of Fire Officials. All fire chemicals including foams, gels, pressure treated lumber, chemical dropped from planes and halon gases should all have to be audited for quality assurance with a complete chain of custody on every batch made and delivered and used like M-Fire does now. All Fire Engineering like E119 should be made to burn before they can be used in any community to prove there Laboratory test results in the real world environments.